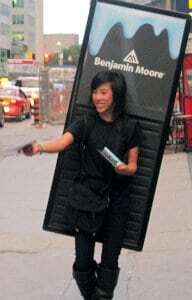 Recently Wild on Media hired 20 Brand Ambassadors to campaign throughout downtown Toronto, wearing (yes, wearing) walking billboard advertisements for Benjamin Moore. The campaign was a huge success, over 40,000 flyers were distributed throughout an 11 day campaign coinciding with the Toronto TIFF Film Festival. Hugely popular in cities throughout Europe, (where many courtyard shopping areas don’t allow vehicle traffic), walking billboards are eye-catching and curious forms of advertising to say the least. It’s utterly impossible to not notice them! Aside from the obvious form of advertising at street level, these two-legged billboard messages can piggy-back (no pun intended) with retail campaigns or shop promotions in larger malls. Having flyer hand-outs at the front of a large mall directing consumers to a targeted area, is a definite plus for any retailer. Eco-friendly and back-lit LED, they can last up to 4 hours outside at night. Advertising with legs!